Download a 1-page breakdown of the show. Download a detailed report about the project. Nathan Harrison, Rachel Roberts, David Finnigan, David Shaw and Nikki Kennedy. Photo by JacksonB. For this project, Boho is joined by members of Sydney collective Applespiel. Active since 2009, Applespiel have developed work for Performance Space, Next Wave Festival, PACT Centre For Emerging Artists and Crack Theatre Festival. Applespiel is represented here by Nathan Harrison, Nikki Kennedy and Rachel Roberts. David is a writer, theatre-maker and producer from Canberra, Australia. 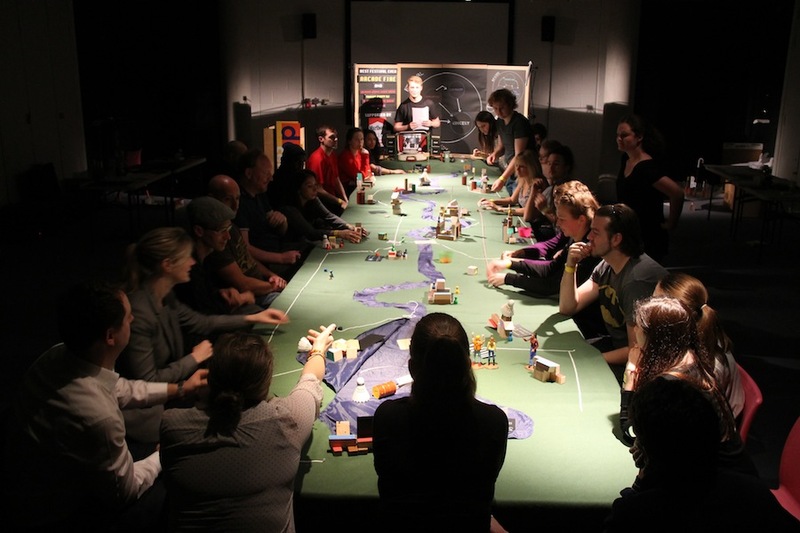 With science-theatre ensemble Boho, David creates interactive performances based on the science of climate and global change, working with research scientists from organisations such as University College London, CSIRO and the Stockholm Resilience Centre. In 2012 David was awarded a Fellowship from the Winston Churchill Memorial Trust to research the intersection of climate science and the performing arts in North America, Europe and Asia. David is an associate artist with UK company Coney and Manila site-specific ensemble Sipat Lawin. In 2014 David received an Early Career Fellowship from the Australia Council for the Arts, in recognition of his interactive performance work with Boho. David founded and co-directed the Crack Theatre Festival in Newcastle (2009-10), and the You Are Here festival in Canberra (2011-13). David is a maths communicator for the CSIRO, ACT, with a focus on interactive, informal science and maths education. He is the founding Editor of CSIRO’s Maths by Email (now Maths and Stats by Email) newsletter, and has performed this role since 2010. He is a contributing editor for The Helix and Scientriffic magazines. David was a keynote speaker at the Mathematical Association of Victoria’s Annual Conference in 2010. For the Tenix Questacon Maths Squad in 2007 he devised and performed interactive maths shows and puzzle-based workshops. David is a founding member of Boho Interactive and has devised and performed in more than 20 interactive performances since 2006. Nikki Kennedy is a performer and interdisciplinary theatre maker with an interest in feminism, psychology, communication and collaborative creative process. Nikki is a co founder of Sydney based performance collective Applespiel and with them has presented numerous works for Malthouse Theatre’s Helium program, Performance Space, Next Wave, Tiny Stadiums, CRACK, You Are Here Festival, Underbelly Arts and the Adelaide and Edinburgh Fringe. Nikki has also presented her own independent work – Writing in White Ink (2011) and Beaches Love Power for CRACK Festival 2013. Most recently Nikki was an international collaborator as part of Sipat Lawin Ensembles Karnabal Festival in Manila and will present a new work – Tragics – for CRACK theatre festival in October. Nathan is a performer, writer and graduate of University of Wollongong Creative Arts (Hons.). In 2012 he was supported by Australia Council’s Artstart to establish an arts-science practice. In this capacity his credits include a stage adaptation of Georges Perec’s experimental mathematical novella and a performance lecture written and performed for Serial Space’s Time Machine festival. He developed The Mayfly Project, a performance about time and sustainability, as part of a Performance Space Quickfire residency, and presented it for Crack Theatre Festival, You Are Here and Bondi Feast. At UOW Nathan acted as performer, technician, director, and curator, notably founding the live art festival Nothing To See Here, now in its seventh year. He is a founding member of Applespiel, and has been involved in works since 2009, in festivals and theatres around Australia and internationally. Nathan is a broadcaster on FBi Radio and a host of the podcast Hottest 100s and 1000s. Rachel Roberts is a Sydney-based performer and graduate of UOW (BCA), UND (Grad. Dip. Ed) and is currently completing studies in Health Science. Rachel has been performing in independent theatre in Sydney, Melbourne and Adelaide with Applespiel, F&C Theatre Makers, and This Hour. An Artstart recipient, Rachel traveled to the UK in 2012 to perform at the Edinburgh Fringe, work as artist-in-residence at University College London and Battersea Arts Centre, and train at RADA and the National Youth Theatre in London. In 2013 Rachel received a Creative Young Star Grant from DEEWR to collaborate with Sipat Lawin Ensemble in the Philippines. She has worked as Festival Coordinator for You Are Here, interned with version 1.0, spoken on several panels for Crack Theatre Festival, and was artist-in-residence at Shopfront Contemporary Arts creating solo works in 2012. In 2014 Rachel undertook a devising secondment under Emma Valente for The Rabble’s Cain and Abel at Belvoir and performed ‘Best Festival Ever’ with Boho Interactive at the London Science Museum, Battersea Arts Centre and Stockholm Resilience Centre. Tassos is a director, dramaturg and co-director of Coney. Coney creates interactive play and immersive playful experience with impact for audiences; it’s an ACE National Portfolio Organisation. Projects include A Small Town Anywhere (BAC, Time Out Critics Choice), RSVP (Dublin Fringe Festival with DYT), Nightmare High (Channel 4 Education, winning a BAFTA), The Loveliness Principle (from BAC to Latitude, Shoreham-by-Sea to Tasmania), NTT (National Theatre); at Forest Fringe in Edinburgh the small pieces Calling Home and The Feast connecting strangers in person and around the world. Prior to Coney, Tassos ran OAR, a platform for developing new work and new artists on the London Fringe and was a theatre-maker and director, winning the first James Menzies-Kitchin award and creating pubQuiz (BAC, Sheffield Crucible, Time Out Critics Choice). 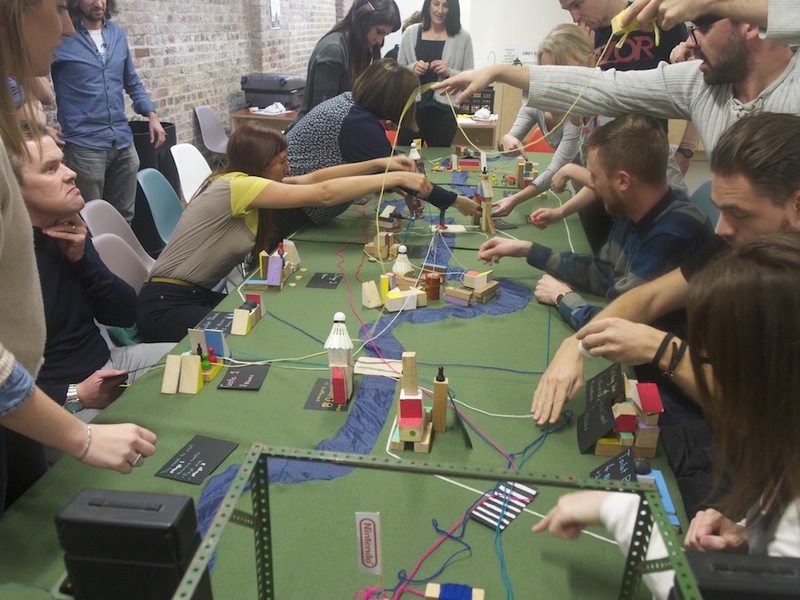 Gary is a London-based designer who creates interactive and engaging experiences for all ages. His practice focuses on creating playful spaces for performance, gaming and other social and educational activities Employing resourcefulness and favouring reclaimed materials and found spaces, sustainability is embedded in his practice. He creates innovative and dynamic event structures that encourage the experimentation and interaction of both artist and audience. Previous clients and collaborators include: the Battersea Arts Centre, Punchdrunk, Forest Fringe, Greenpeace, HIDE and SEEK, The London Snorkelling Team, Coney, Camden People’s Theatre, LIFT, Blood Red Shoes, Punderson Gardens, London Word Festival and Stoke Newington International Airport. Brian Walker & David Salt – Resilience Thinking / Resilience Practice – These two books became textbooks for us in the process of making this work. In particular, Resilience Practice gave us the toolkit we used to apply the resilience framework to various different systems, from music festivals to beach towns to newsagents. 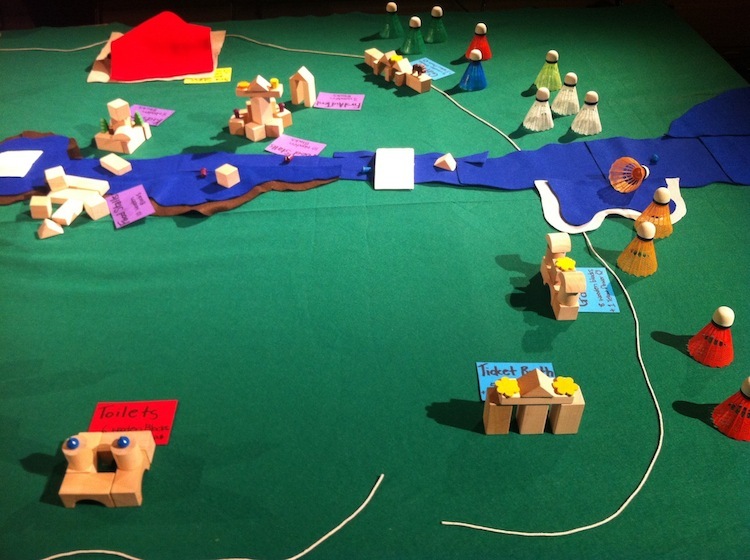 Waters Foundation – Systems Thinking – This website provides a very simple overview of Systems Thinking intended for a high school audience. Some very good practical concepts (particularly the Habits of a Systems Thinker section) for everyday practice. Best Festival Ever was developed in 2011-13 through residencies at the University College London Environment Institute, the Battersea Arts Centre and Arts House Melbourne. 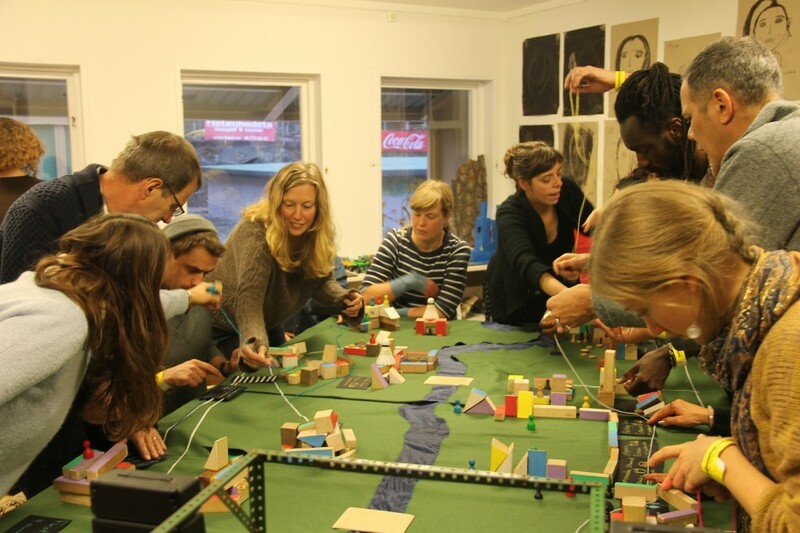 In 2014, the work had public seasons in the UK and Sweden at the Battersea Arts Centre, the London Science Museum’s Dana Centre, Kings College London, Central St Martins College, Forum for the Future, the Stockholm Resilience Centre, Miljoverkstan and Fargfabriken. In 2015, the work will be shown in Australia at the Canberra Street Theatre. This work has been supported by Coney, University College London, Tipping Point, NEDNet Foundation, Arts House and the Australia Council for the Arts. Best Festival Ever is available to tour for one-off presentations or full performance seasons to a range of venues. The show is lightweight and easily transportable, with only three performers and a minimal set. 60 minutes, with facilitated workshop/discussion an optional extra. Up to 30 participants per show, with the option of presenting multiple shows per day. The only venue requirement are a table and chairs. 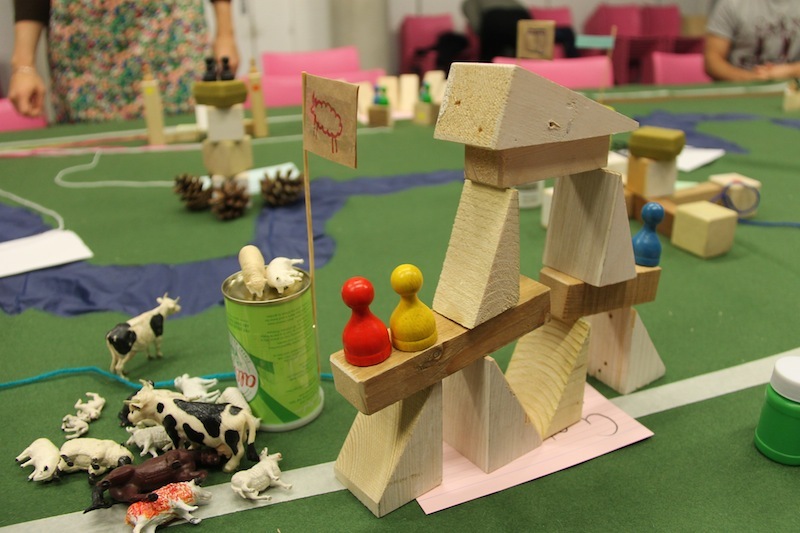 Best Festival Ever can be delivered as a corporate training and team-building exercise, combining a fun scenario management exercise with useful Systems Thinking tools. If you are interested in hosting a performance of Best Festival Ever, please contact us to discuss your needs. For more images of the show, visit our Flickr gallery.